I've been fascinated with bike tubes as a material for years now, and I'm not alone; the smooth, flexible rubber makes such a lovely leather substitute that quite a few budding designers have fashioned the tubes into strange, lumpy messenger bags and wallets. Finally, the mysterious Watercycling have gotten it just right. 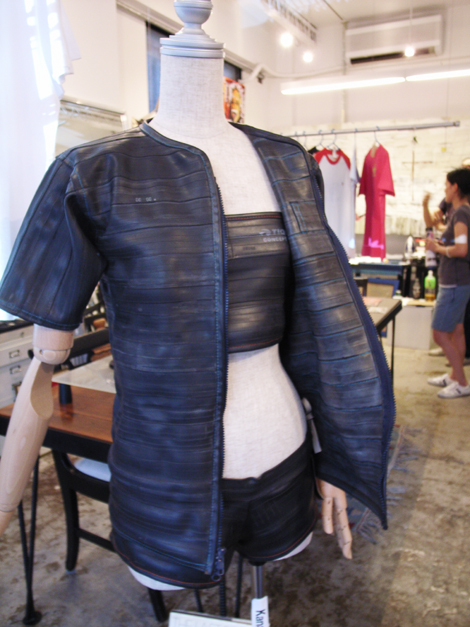 With no website and no designer's name attached, at least not in English, the company makes splendid bags out of bike tires and tubes, and recently displayed some crazy armor-fetish clothes made from tubes at an event documented by pedalmafia in Japanese. Available for purchase at Rodafixa in Hong Kong.